CAN BRUTAL POWER GO WHAM AT GEELONG? The new season has started well for the stable and we have two nice horses to run at Geelong on Monday. Brutal Power will be the first to go in race one, the 3YO Maiden (1100m) and Wham runs in race five, the Maiden Plate (1300m). Brutal Power (pictured) makes his belated debut after being scratched at the barriers last month and the son of The Factor has struck a hot field. “He’s drawn five out of eleven but looking at the field it appears to be a very strong race,” Mike Moroney said. 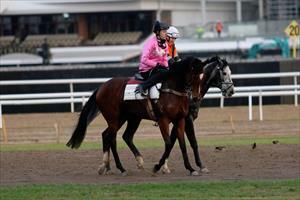 “All the good trainers have some first starters and well-bred horses so it will not be easy. “I’m very happy with our horse however, he’s still a work in progress but he possesses natural talent. Wham pleased Moroney with his debut effort to finish sixth at Sale behind subsequent Sandown winner Smart Elissim. “He’s trained on well and improved,” Moroney said of the son of Fiorente. “What he needs more than anything else is the practice. “It’s not ideal drawing wide but we’ll come back on him, try and find some cover and give him a chance to balance up and run home. Prince Of Arran was an intended runner in race eight, the Benchmark 58 Handicap over 1700m, but will be scratched after drawing barrier 19.